The second chapter of Lu Yu’s Classic of Tea (Cha Jing 茶经) documents the tea equipment in use in the 7th century A.D. – the 16 tools used in processing tea, from the picking stage, through the steaming, pressing and drying, to the storing and forming into cakes. They’re a bit more rudimentary but basically the same as the equipment still being used today. Included in this chapter are references to ancient classical historical texts, units of measurement and the types of tea that were popular during the Tang dynasty. I have managed to find some pictures of this equipment from various Chinese tea books and have presented them here. As I write this blog, the sounds and smells of my ancestors making tea with slightly primitive but ingenious tools seem to surround me. Reading Lu Yu is so evocative! Four: Utensils 四之器 (Part I), Part II & Part III:- This chapter describes twenty five items used in the brewing and drinking of tea. Six: Drinking 六之飲:- This chapter describes the various properties of tea, the history of tea drinking and the various types of tea known in 5th century China. 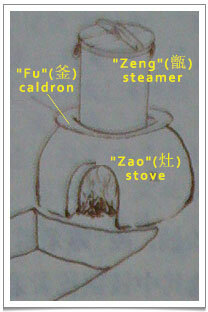 The second item listed by Lu Yu is the “zao” (灶), a stove for burning logs. He recommends using one without a smokestack. The third item is the “fu” (釜) which is a kind of cauldron or kettle used in the steaming process. It might be made from iron, copper or clay. Lu Yu advises using one with a lip, probably to prevent any flint or smoke getting into the tea leaves from the log stove. 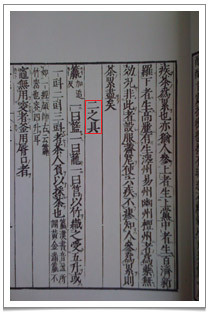 “Zeng” (甑) is the fourth item listed by Lu Yu. It resembled the typical bamboo steamer used in dim sum restaurants, but in ancient China it was made from wood or clay. Inside was a bamboo slat on which the tea leaves to be steamed would be laid. A little water would be added to the zeng, placed over the fu, to provide continuous steam. Then, Lu Yu says, the steamed leaves were spread out using a special three-pronged fork (made from branches from the tea fields), allowing them to cool and preventing their juices from escaping. I believe this is one of the earliest records of the steaming of tea leaves to make green tea. Steaming was characteristic of the Tang Dynasty and was taken by Japanese monks back to Japan, where it remains the usual method of tea processing. The Chinese went on later to developing the techniques of pan-firing. The fifth item, “wu jiu” (忤臼), also called “dui” (碓), is essentially a pestle used for crushing steamed tea leaves. 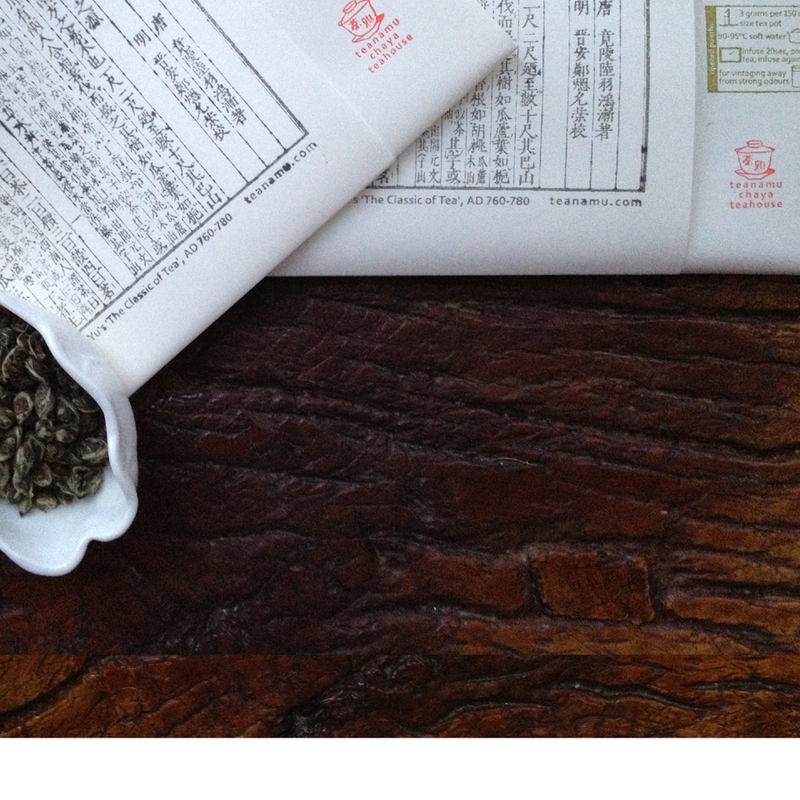 Lu Yu says that the best wu jiu is one that has been frequently used. I imagined what Lu Yu meant was that a well seasoned pestle is easier to use than a brand new one. The sixth item of equipment is a “gui” (规), also known as “mo” (模) or “juan” (桊). These are really little moulds in which steamed, softened tea leaves are pressed into cakes. 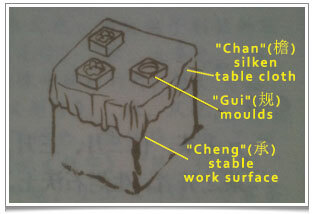 The moulds, according to Lu Yu, were made from iron and could be round, square or fancy non-geometrical shapes. Again, this gives insight into the types of compressed tea commonly drunk during the Tang dynasty. The seventh item is a “cheng” (承) which is a table used as a working surface for compressing teas. Often it was made from stone. Lu Yu says that, if on the other hand it’s made from the wood of the locust or mulberry tree, then the table’s legs should be half buried in the earth so as to provide a steady work surface. Item number eight is a “chan” (檐 – a character which now refers to the eaves of a house). Lu Yu describes it as a used poncho or a piece of soft silk to be used as a tablecloth cover over the cheng. Gui would then be placed on top of the chan to make bricks of tea. 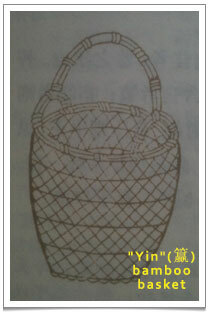 Yin – A bamboo basket for holding tea leaf pickings. Stove, cauldron and steamer for steaming of tea leaves. A stone work surface covered with a silk cloth for compressing tea leaves into tea cakes using moulds. The 9th to the 16th pieces of apparatus will be detailed in the Part 2 of Cha Jing Chapter 2 in the next blog.